Ants perform destructive disinfection in response to lethal fungal infections of pupae. (A) Destructive disinfection starts with the unpacking of pupae from their cocoons and is followed by grooming, biting and poison spraying (ants housed on blue pH-sensitive paper to visualise acidic poison spraying, which shows up pink). (B) Unpacking occurred when pupae were exposed to fungal conidiospores and was dose-dependent, happening sooner and in higher amounts as the dose of conidiospores increased (letters denote groups that differ significantly in post-hoc comparisons [model revelling; p<0.05]). (C–E) Comparison of the ants’ behaviour between sanitary care and destructive disinfection. Destructive disinfection is characterised by increases in grooming duration, poison spraying frequency and biting frequency (all data points displayed; lines ± shaded boxes show mean ± 95% confidence intervals [CI]; letters denote groups that differ significantly in logistic regressions [p<0.05]). (F) Scanning electron micrographs (SEM) of an asymptomatic infected pupa immediately after unpacking, and (G) of a destructively disinfected pupa 24 hr later. We washed pupae to recover conidiospores from their (A) cocoons and (B) cuticles. The washes were then plated and the resultant colony-forming units (CFUs) were counted. Whilst we could recover many conidiospores from cocoons and pupae immediately after pathogen exposure, we recovered almost no viable conidiospores from unpacked pupae and their removed cocoons (cocoons: Mann-Whitney U test, U = 112, p<0.001, pupae: U = 84, p=0.037). This indicates that, at the time of unpacking, most conidiospores have been removed and/or chemically disinfected by the ants during sanitary care, or have successfully germinated and caused internal infections within the pupae. All data points displayed; line ± shaded boxes show mean ± 95% CI. Letters denote groups that are significantly different in Mann-Whitney U tests (p<0.05). Unpacked pupae are killed by destructive disinfection. Unpacked pupae were observed for signs of mortality (observations for contractions of dorsal aorta) immediately after unpacking (0 hr) or following destructive disinfection by ants (24 hr after unpacking). At the time of unpacking, the majority of pupae were still alive, whilst pupae left with workers for 1 day were mostly dead. In addition, the later pupae were unpacked the more likely they were to have already died (GLM: overall model LR χ2 = 49.76, df = 2, p<0.001; 0 vs. 24 hr: LR χ2 = 36.28, df = 1, p<0.001; effect of time: LR χ2 = 16.19, df = 1, p<0.001). Error bars show ± 95 % CI. Letters show groups that are significantly different in logistic regression (p<0.05). Unpacked pupae and pathogen-exposed pupae that were not unpacked (cocooned) were removed from ants and incubated for fungal growth to determine how many were infected. A greater amount of unpacked pupae were infected than those that were not unpacked. Error bars show ± 95 % CI. Letters show groups that are significantly different in logistic regression (p<0.05). Destructive disinfection reduces pupa pH. 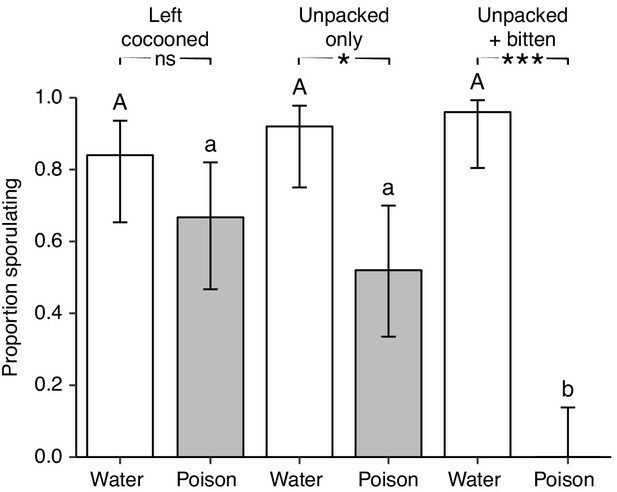 Pupae that were unpacked by the ants received more poison within the 24 hr after unpacking – when ants perform destructive disinfection – compared to non-unpacked pathogen-exposed pupae and both controls (LMER: overall model LR χ2 = 59.01, df = 3, p<0.001; interaction between unpacking and treatment: LR χ2 = 15.42, df = 1, p<0.001; Tukey post-hoc comparisons: cocooned control vs. unpacked control, p=0.25; cocooned control vs. cocooned pathogen, p=0.002; all others, p<0.001). All data points displayed; lines ± shaded boxes show mean ± 95% CI. Letters denote groups that differ significantly in Tukey post hoc comparisons (p<0.05). Destructive disinfection is induced by changes in the chemical profile of infected pupae. (A) Pupae washed in pentane solvent to reduce the abundance of their cuticular hydrocarbons (CHCs) were unpacked less than unwashed or water-washed pupae (positive and handling controls, respectively; error bars show ± 95% CI; letters specify significant Tukey post hoc comparisons [p<0.05]). (B) Unpacked pathogen-exposed pupae have distinct chemical profiles compared to sham-treated control pupae. Pathogen-exposed pupae that were not unpacked (cocooned group) have intermediate profiles (axes show discriminant analysis of principle components eigenvectors). (C–F) The four CHCs with higher relative abundances on unpacked pupae compared to both control and cocooned pupae: (C) Tritriacontadiene, C33:2 (D), Tritriacontene, C33:1 (E), Pentatriacontadiene, C35:2 (F) co-eluting Pentatriacontadiene and Pentatriacontene, C35:2 + C35:1 (all data points displayed; line ± shaded box show mean ± 95% CI; letters specify groups that differ significantly in KW test post hoc comparisons [p<0.05]). Total abundance of cuticular hydrocarbons (CHCs) on pupae. 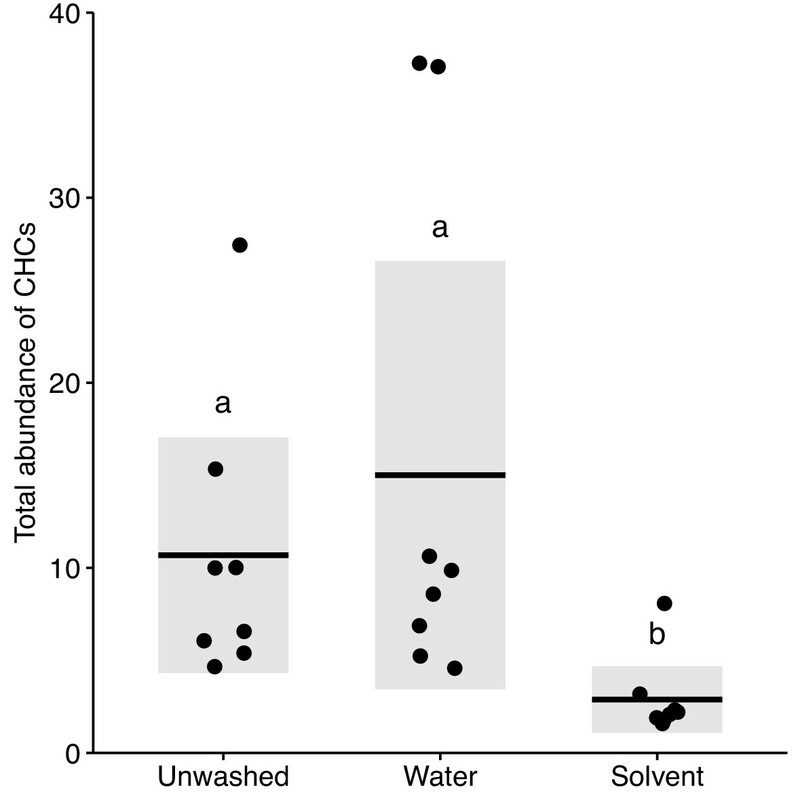 Washing pupae in pentane solvent reduced the total amount of extractable CHCs on pupae, compared to unwashed and water-washed control pupae, confirming that this method is effective at reducing CHC abundance (KW test: H = 12.26, df = 2, p=0.002; post-hoc comparisons: unwashed vs. water, p=0.73; all others, p<0.001). All data points displayed; lines ± shaded boxes show mean ± 95% CI. Letters show groups that differ significantly in post-hoc comparisons (p<0.05). The cuticular hydrocarbon (CHC) profiles of unpacked and control pupae. 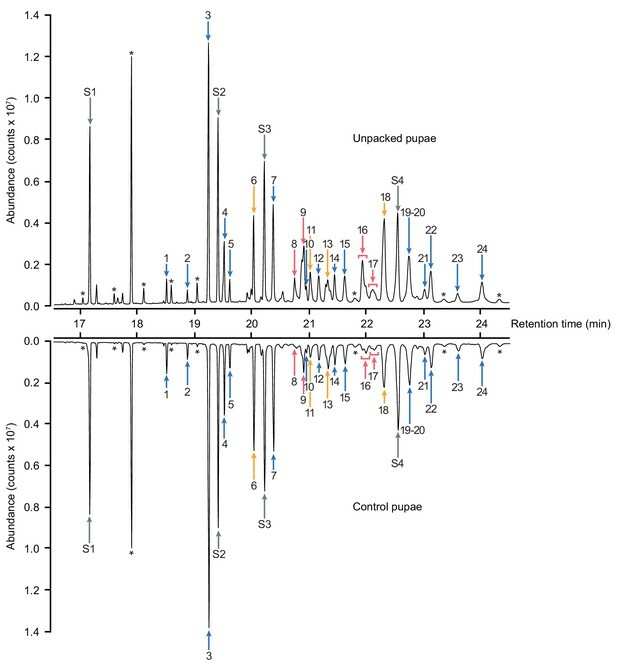 Example total ion chromatograms of an unpacked pathogen-exposed pupa (top) and a sham-treated control pupa (bottom), showing the 24 CHC peaks extracted from the pupae/cocoons (for identifications see Table 1) and the added internal standards S1-4 (grey arrows; S1 = n-Tetracosane-d50; S2 = n-Triacontane-d62; S3 = n-Dotriacontane-d66; S4 = n-Hexatriacontane-d74). Contaminants resulting from column bleeding (e.g. phthalic ester) are marked by asterisks. Red arrows indicate those compounds that showed significantly higher relative peak intensity on pathogen-exposed unpacked pupae, compared to both pathogen-exposed, yet left cocooned, or sham-treated pupae (Table 2). Orange arrows show the peaks that differ between pathogen-exposed unpacked and sham-treated pupae, but not between pathogen-exposed unpacked and cocooned pupae. Blue arrows mark all remaining peaks. Change in immune gene expression of pupae injected with fungal cell wall components. Pupae were injected with β−1,3-glucans (green dots) – a highly conserved pathogen-associated molecule that acts as an immune elicitor of the invertebrate immune system – or ant physiological saline as a control (grey dots), and tested for their change in immune gene expression 48 hr after injection. 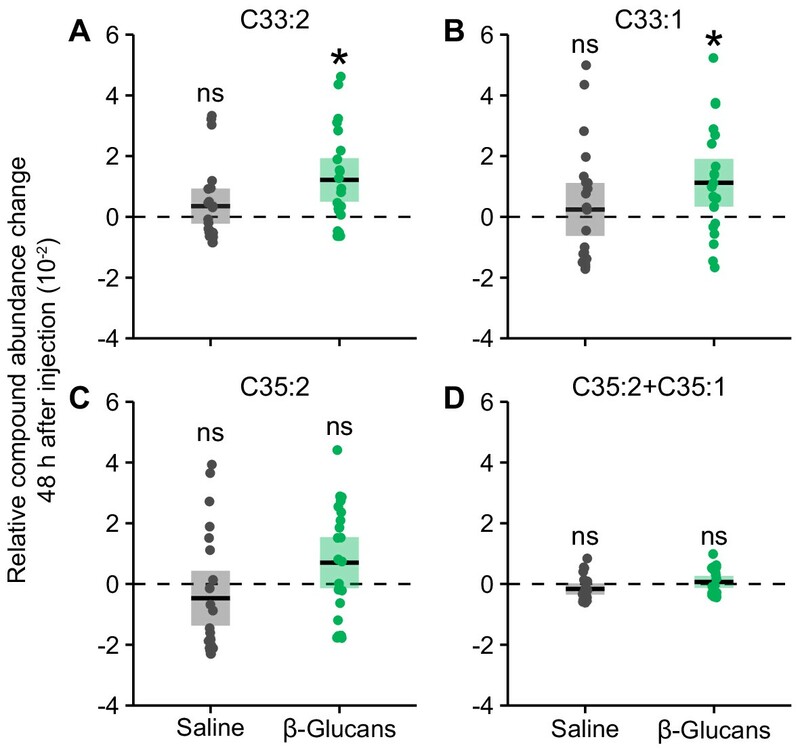 Injection with β-glucans did not affect the gene expression of (A) the melanisation cascade-regulating gene proPO (Cerenius and Söderhäll, 2004) (saline: Mann-Whitney U test, U = 69, p=0.06, β-glucans: U = 55, p=0.75) within 48 hr of injection. However, both (B) PGRP-SC2, an IMD pathway regulator gene (Bischoff et al., 2006), and (C) β−1,3-GBP, a pattern recognition protein that specifically binds to fungal β-glucans (Ma and Kanost, 2000; Gottar et al., 2006), showed increased gene expression 48 hr after injection, compared to pupae immediately after injection (PGRP-SC2: U = 17, p=0.0095; β−1,3-GBP: U = 19, p=0.01), but not following saline injection (PGRP-SC2: U = 70, p=0.06; β−1,3-GBP, saline: U = 81, p=0.0095, a significant down regulation). Data points display the difference in gene expression 48 hr after injection to mean gene expression immediately after injection; statistical analysis was carried out on full data set. Solid lines ± shaded boxes show mean ± 95% CI. Asterisks show groups where gene expression (48 hr after injection) differs significantly (p<0.05) from expression immediately after injection (dotted line); *=p<0.05; **=p<0.001; ns = non-significant. 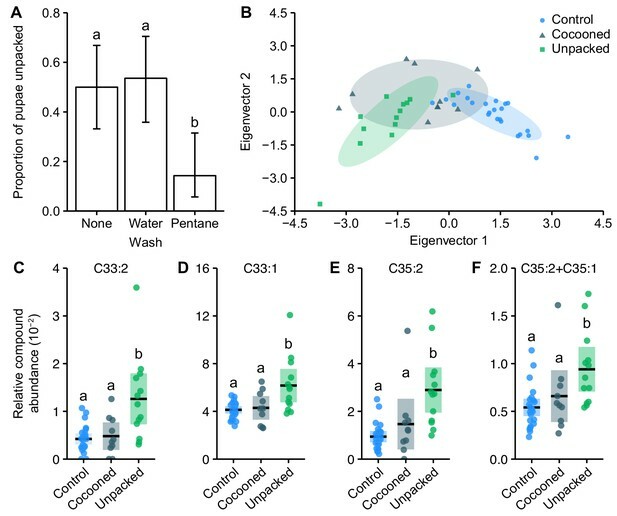 Injection of fungal cell wall components increases abundance of chemical cues that are increased on unpacked pupae. Pupae injected with β−1,3-glucans (green dots) had increased relative abundances 2 days after injection compared to pupae immediately after injection, of (A) Tritriacontadiene, C33:2 (LMER: LR χ2 = x, df = 1, p=0.012) and (B) Tritriacontene, C33:1 (LR χ2 = 6.40, df = 1, p=0.046), but not (C) Pentatriacontadiene, C35:2 (LR χ2 = 1.56, df = 1, p=0.42) or (D) co-eluting Pentatriacontadiene and Pentatriacontene, C35:2 + C35:1 (LR χ2 = 0.25, df = 1, p=0.70). However, the abundances of these four compounds did not increase in saline-injected pupae (grey dots; all p>0.05). 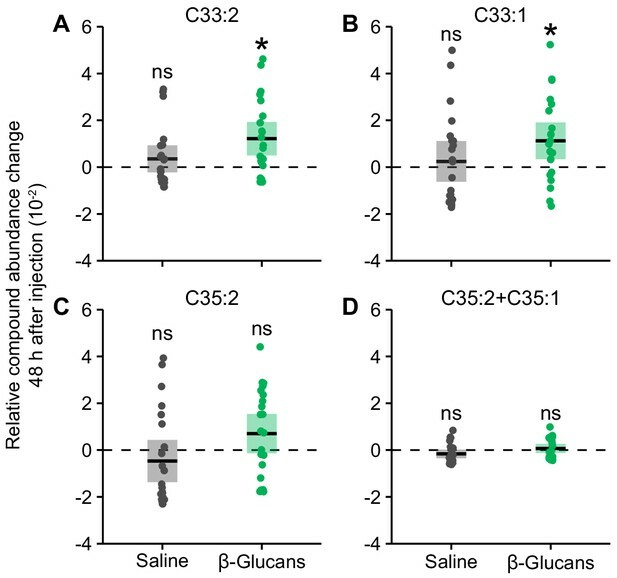 Hence, injection of β−1,3-glucans results in higher CHC abundance for two out of the four CHCs that were also specifically increased on Metarhizium-infected, unpacked pupae (Figure 2C–F). Data points display the difference in CHC abundance 48 hr after injection to mean CHC abundance immediately after injection; statistical analysis was carried out on full data set. Solid lines ± shaded boxes show mean ± 95% CI. Asterisks show groups where CHC abundance (48 hr after injection) differs significantly (p<0.05) from mean abundance immediately after injection (dotted line); *=p < 0.05; ns = non-significant. Destructive disinfection by ants prevents pathogen replication. (A) Destructive disinfection greatly reduced the probability of pupae sporulating compared to pupae that received no destructive disinfection (time point 0), and its effectiveness increased with the length of time ants could perform destructive disinfection (1 vs. 5 days; error bars show ± 95% CI; letters denote groups that differ significantly in Tukey post-hoc comparisons [p<0.05]). (B) The individual components of destructive disinfection (unpacking, biting and poison spraying) interacted to inhibit pathogen replication (% of pupae sporulating in each treatment shown under graph in green). 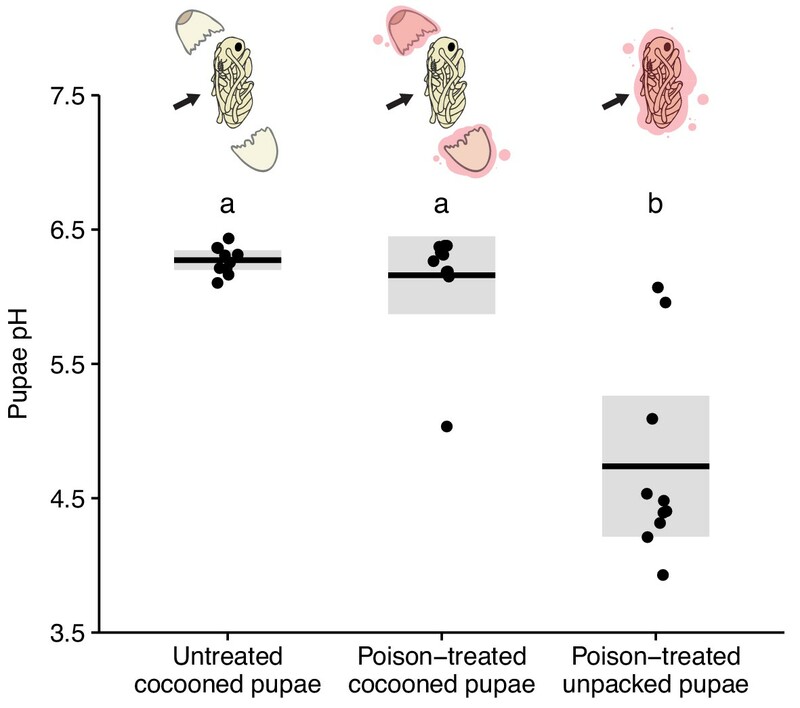 The odds of sporulation for cocooned and unpacked pupae treated with poison were not significantly different to those of control pupae (cocooned pupae treated with water). But when unpacking, biting and poison spraying were combined, the odds of sporulation were significantly reduced (logistic regression; ns = non-significant deviation from control, ***=p<0.001; complete data set of full factorial experiment displayed in Figure 3—figure supplement 3 and all statistics in Table 3). Destructive disinfection of infected pupae in small groups of ants is less efficient. 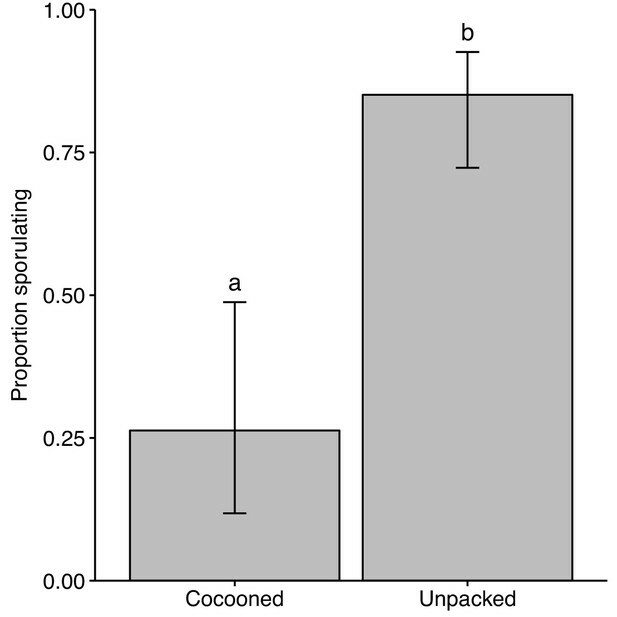 Destructive disinfection by groups of three ants greatly reduced the probability of pupae sporulating compared to pupae that received no destructive disinfection (time point 0) 5 days after unpacking. 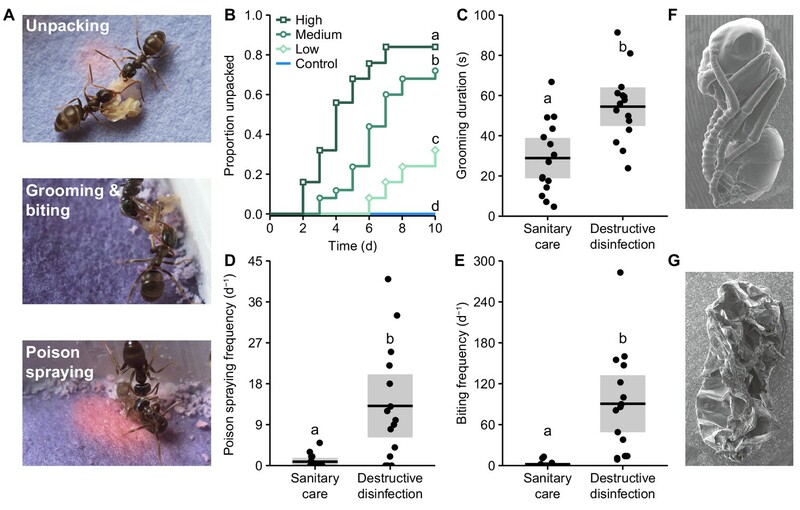 However, the proportion of pupae sporulating was equal when ants only had one day to perform destructive disinfection, as compared to those that received no destructive disinfection (time point 0). Error bars show ± 95% CI; letters denote groups that differ significantly in Tukey post-hoc comparisons (p<0.05). Comparison of ant and synthetic poison spraying. Experimental application of synthetic poison (60% formic acid and 2% acetic acid, in water [Tragust et al., 2013a]) resulted in pupae receiving quantities of poison similar to pupae kept with ants for 1 day after unpacking (determined by measuring pupal pH after spraying them with poison and comparing to data from Figure 1—figure supplement 3; Mann-Whitney U test: U = 303, p=0.38), meaning we were applying poison to pupae in realistic amounts as compared to the ants and inducing an equivalent decrease in pH change. All data points displayed; lines ± shaded boxes show mean ± 95% CI. Treatments were non-significant (ns) in a Mann-Whitney U test (p>0.05). Unpacking, biting and poison application interact to inhibit fungal sporulation. Only when all three ‘behaviours’ are performed is fungal sporulation completely prevented (grey = poison, white = water). Error bars show ± 95% CI. 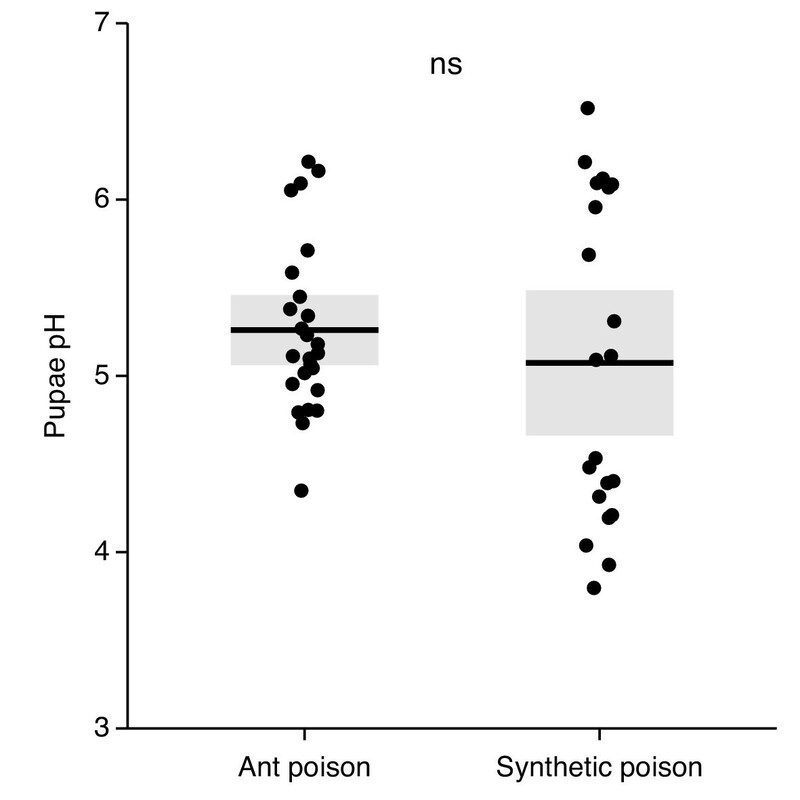 Uppercase letters denote bars that differ (p<0.05) within the water treatment, lowercase letters show differences within the poison treatment, and asterisks indicate differences within pupal groups: ns = non significant, *=p<0.05, ***=p<0.001 (full post-hoc comparisons given in Table 3). The pupal cocoon blocks the application of poison. Cocooned pupae treated with poison had a pH equivalent to untreated cocooned pupae, whereas poison-treated unpacked pupae had a significantly decreased pH, revealing that the cocoon blocks the application of poison (KW test: H = 18.22, df = 2, p<0.001; post hoc comparisons: untreated cocooned vs. poison-treated unpacked, p=0.91; all others, p<0.001). All data points displayed; lines ± shaded boxes show mean ± 95% CI. Letters denote groups that differ significantly in post-hoc comparisons (p<0.05). Destructive disinfection stops disease transmission. 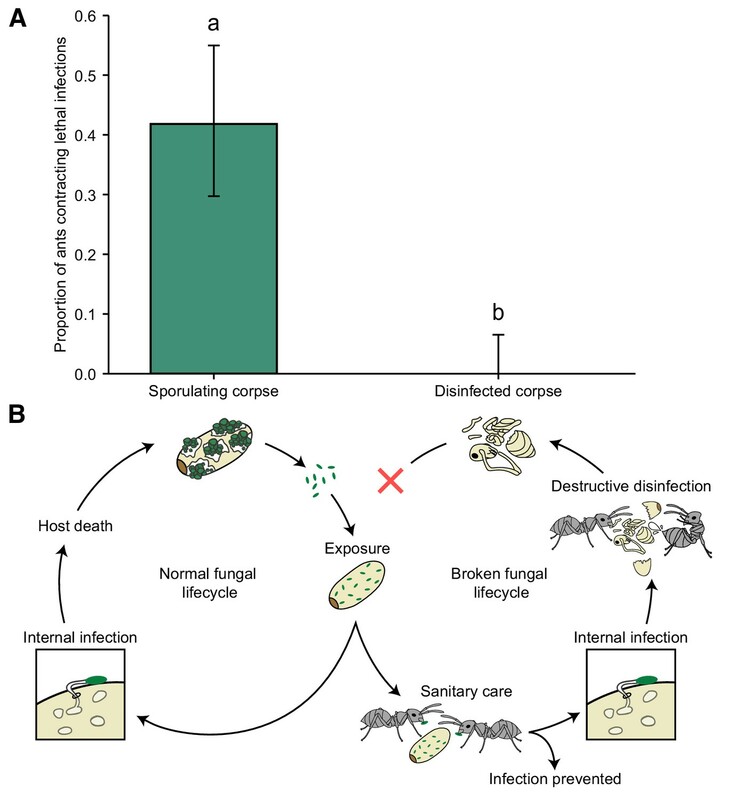 (A) Ants that interacted with sporulating pupae contracted lethal infections and died from fungal infection in 42% of the cases, whilst there was no disease transmission from destructively disinfected pupae (error bars show ± 95% CI; letters denote groups that differ significantly in a logistic regression [p<0.05]). (B) Overview of normal fungal lifecycle resulting in infectious, sporulating corpses (left) and a broken lifecycle due to the interference of the ants (right). When sanitary care fails to prevent infection in pathogen-exposed individuals, the ants switch to colony-level disease control, that is destructive disinfection to stop pathogen replication, resulting in non-infectious corpses. Ants performing destructive disinfection of an infected pupa. Video shows Lasius neglectus ants performing destructive disinfection towards a Metarhizium-infected pupa. Video playback is 8 x normal speed. Compound identification of cuticular hydrocarbons (CHCs) from Lasius neglectus pupae. Table shows all 24 CHCs, with peak numbers listed in the order of their retention time, as in Figure 3—figure supplement 2. 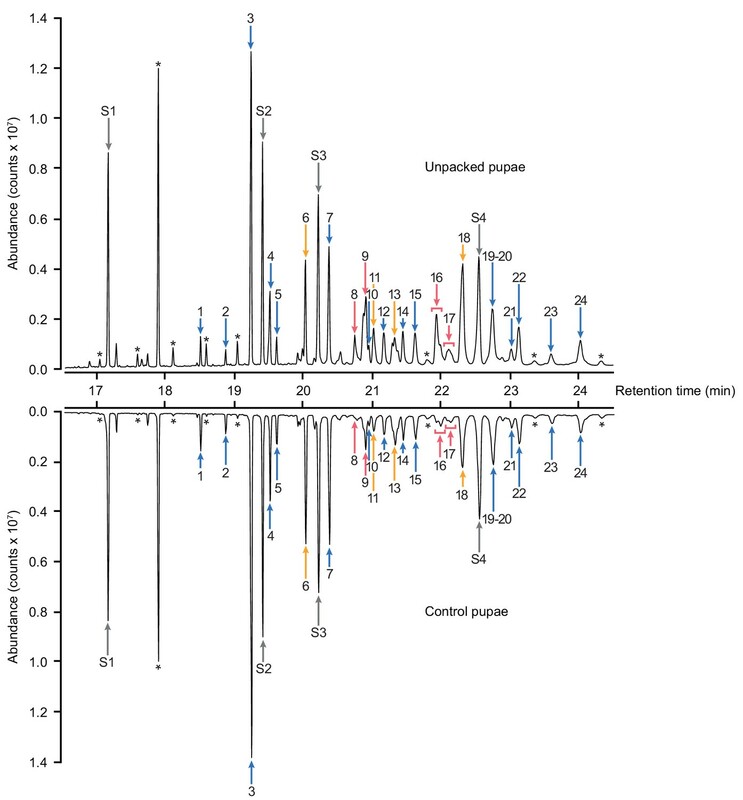 For comparability across gas chromatography–mass spectrometry systems, modified Kovats indices are included. Peaks that were significantly higher on unpacked pupae are highlighted in bold. In peaks 17 and 18, two compounds co-eluted. Compounds contributing most to the differences between pupal cuticular hydrocarbon (CHC) profiles. Table gives the overall effect of treatment per CHC, corrected for multiple testing, and the post-hoc comparisons, corrected at the level of each compound for multiple comparisons. CHCs significantly increased specifically on unpacked pupae shown in bold. All multiple comparison corrections performed using the Benjamini-Hochberg procedure (α = 0.05). Tukey post-hoc comparisons between in vitro chemical treatments and pupa manipulations. 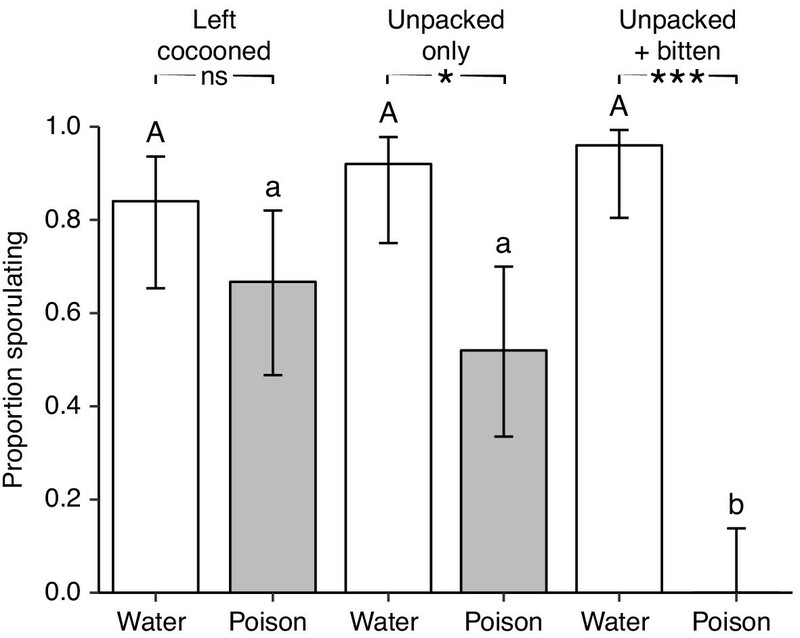 Following a GLM showing a significant interaction between chemical treatment (water or synthetic poison) and pupae manipulation (cocooned, experimentally unpacked or experimentally unpacked and bitten), we performed Tukey post-hoc comparisons to determine the influence of each behavioural component. Comparisons to pupae that received complete destructive disinfection (unpacked + poison + biting) are shown in bold. All p values are corrected for multiple testing using the Benjamini-Hochberg procedure (α = 0.05). Primer sequences, annealing temperatures and amplicon sizes for the immune genes proPO, PGRP-SC2 and β−1,3-GBP and the reference house keeping gene 28S RP S18a of the invasive garden ant, Lasius neglectus, as obtained from (Konrad et al., 2012) and cDNA sequence information (Meghan L. Vyleta, AVG, SC unpublished data).